I was hoping to post by now about last week's visit to a traditional Japanese swordsmith, but I've been down with a cold for the last three days. Unfun. So, here's a “What am I?” quiz to pass the time... what is this implement from the swordsmith's workshop for? That looks like a tool that is used to shape and grinding wheels. Crikey, I have no idea what its proper name is though. I don’t know the english word for it but is used to make a kind of patern ( grid) on a surface and most of the time it is used on a lathe. I think it’s a thingummy for re-surfacing a grindstone. I may even have one somewhere. 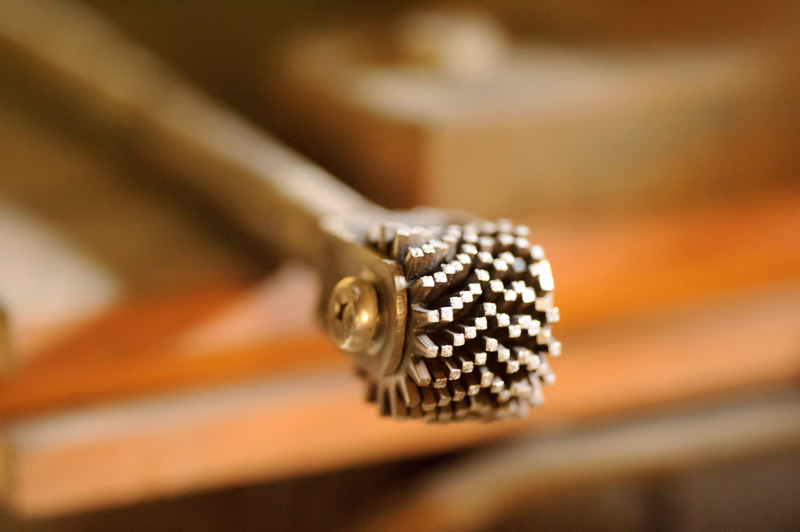 This is a tool that is used to dress stone wheels. By keeping the grinding wheel flat you can achieve better sharpening of the metal. Dad thinks it’s a stone-dresser, and now that I think of it, I believe it is.